Painting The Feminine Spring session begins May 20th. EARLY BIRD Registration is now open! …Because it is YOUR unique process. In this four-week online adventure you will breathe new life into your creative practice, develop a unique body of artwork, and begin to crack the code on your own visual language while strengthening your personal style. As an artist I use my creative practice as a way of tapping into my inner guidance and making meaning as my life unfolds — in other words my creative practice calls the shots. 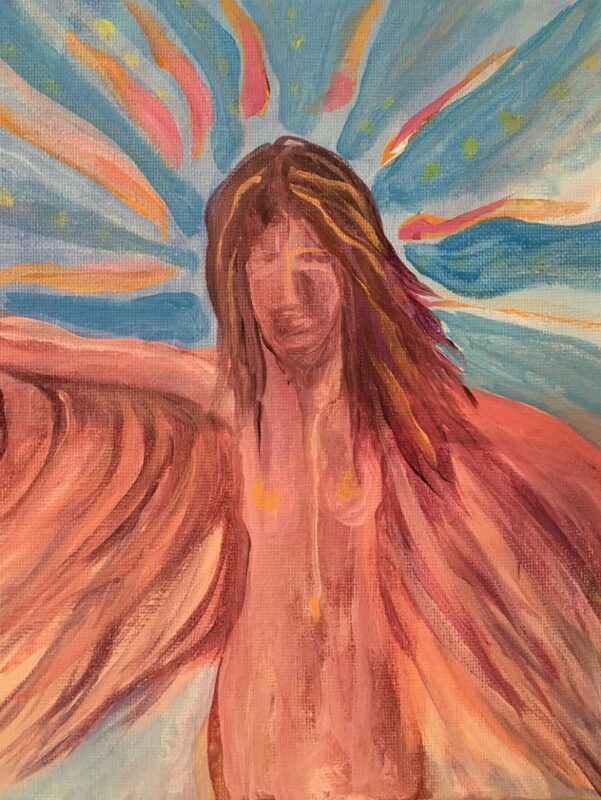 I call my process Painting The Feminine and since 2013 I have been inviting women world-wide to join me in creating their own Painting The Feminine practice. 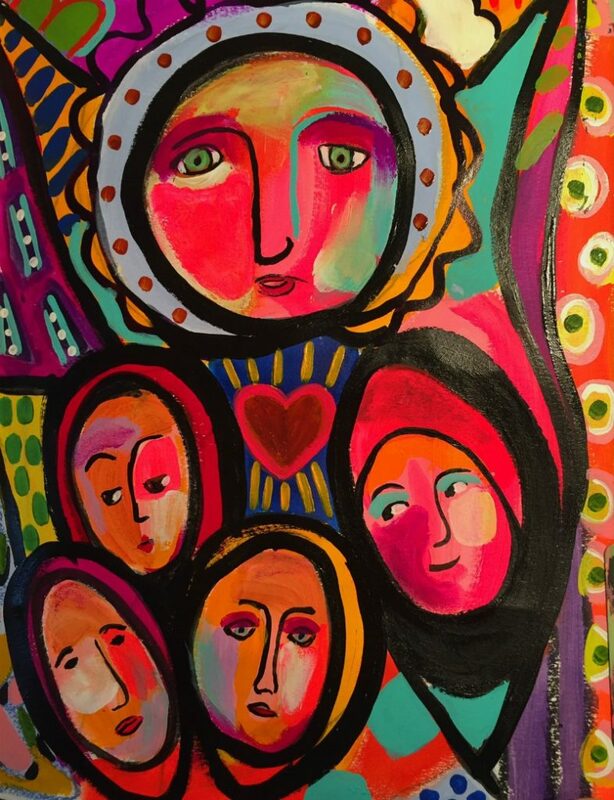 Together we discuss and define what Feminine wisdom means to us individually while exercising our hand-to-heart connection through a daily painting creative practice and storytelling. I believe there’s an intuitive narrative that runs beneath the art we make. When we take some time to clear the energetic debris that crowds our creative practice we can tap into this wisdom with great ease and over time trust the guidance we receive. Painting The Feminine is a sure way of cleaning up the junky-junk and realigning your hand with your heart so your creativity can flow like an ol’ mighty river. Do you hear it calling you? Scroll down to learn more or register between now and Sunday night and save $40! Please read the cancellation & refund policy located at the bottom of the page before registering. Your payment acts as agreement to these terms. Within 24 hours of receiving your payment an official welcome email will be sent to the email address used to make your purchase. 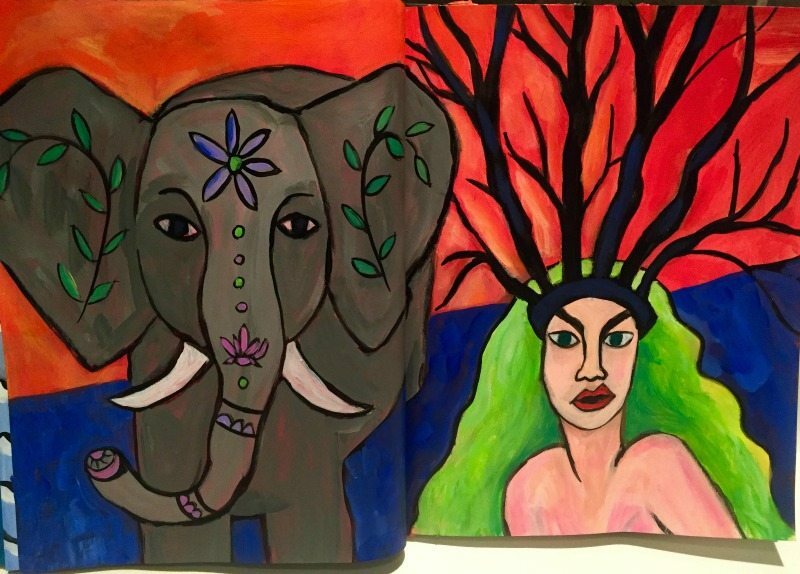 Painting The Feminine is about your mark, your voice, and your unique creative practice. 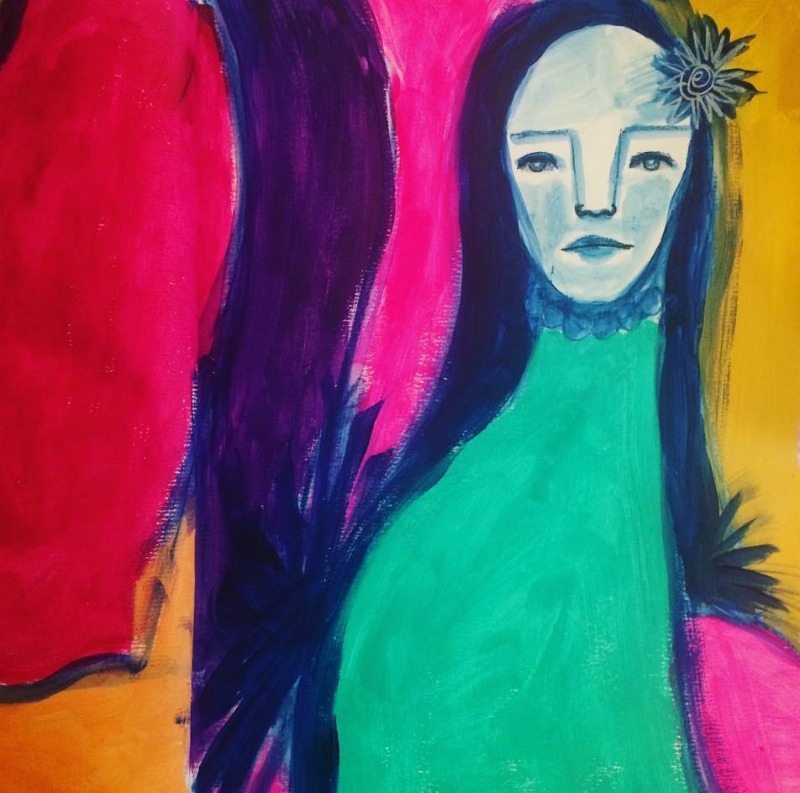 In Painting The Feminine you will NOT learn how to paint like me, Connie Solera. In Painting The Feminine you will leave with a deeper understanding of your own personal visual language and a stronger confidence in the mark making and voice you naturally possess. In Painting The Feminine you will NOT receive step-by-step instructions on how to paint. 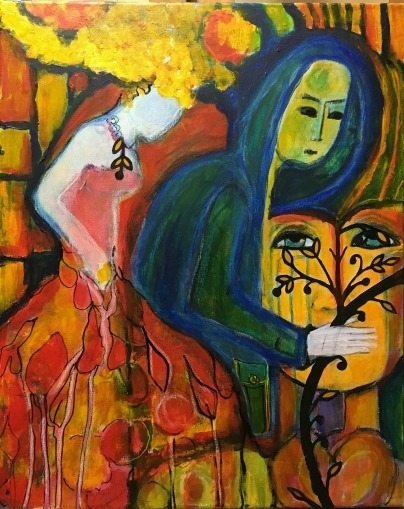 In Painting The Feminine storytelling is the doorway we use to enter our imagination and prompt our creative practice. If this scares the gajeebers out of you — great! Painting The Feminine is definitely for you. Take my hand. We’ll navigate this new territory together. In Painting The Feminine you will receive an intimate peek into my own painting process as I invite you into my studio each Friday. 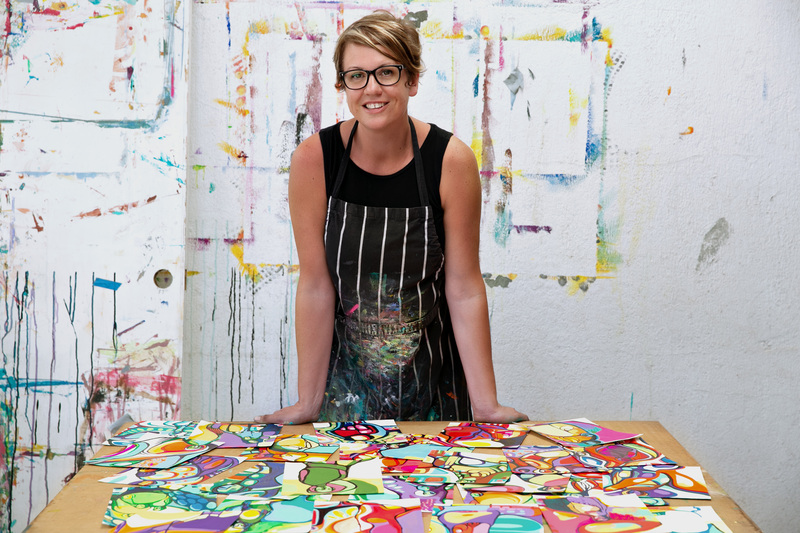 I can’t wait to share with you techniques and approaches I use to keep my painting practice juicy and aligned with my heart. I will also guide you on how to make these techniques and approaches uniquely yours. 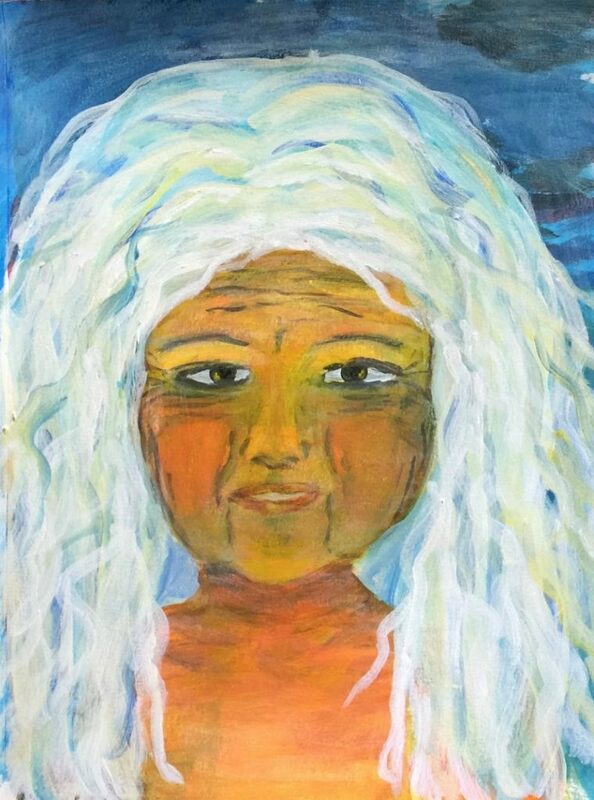 In Painting The Feminine all experiences, skill levels, and backgrounds are welcomed. Each artist is honored and celebrated for exactly where they are in their artist development and I will meet you there and take you deeper. Promise — it’s my speciality! In Painting The Feminine you don’t need top-of-the-line supplies and materials. Use what you have on hand or what you can afford. What is most important is that you listen to your inner guidance and follow it. Sometimes that means using untraditional supplies or straying from painting altogether! That’s the Feminine for ya — wild! 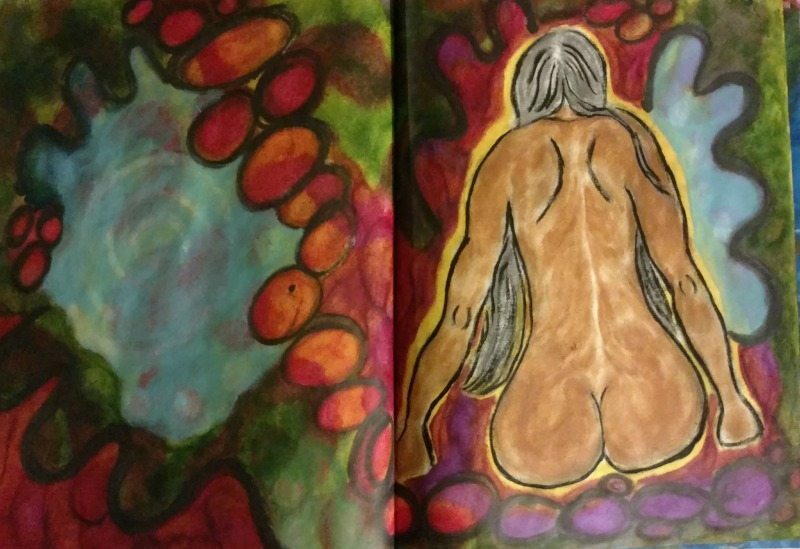 For Painting The Feminine to work its magic on you it requires an intention and a commitment but it’s important to state that every woman’s process and experience will look completely different. 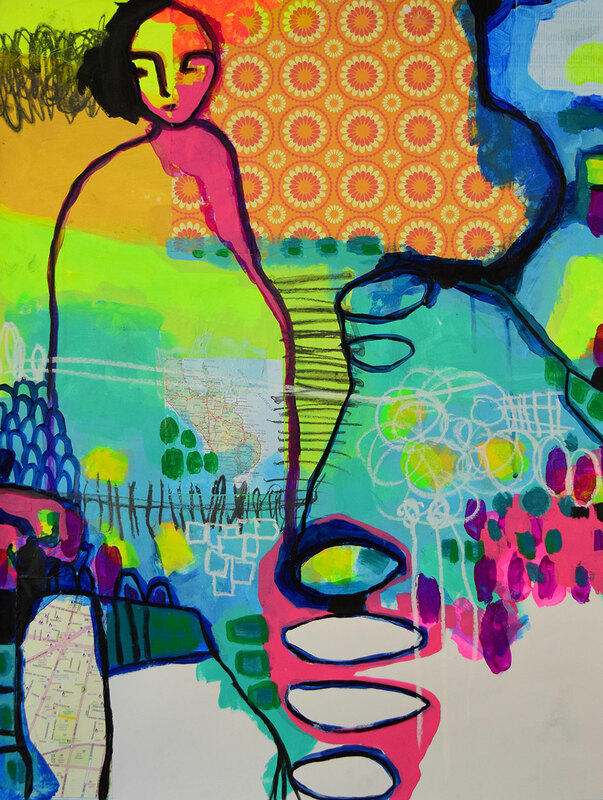 In Painting The Feminine we practice trusting the wisdom of our own pace and rhythms. That’s why all of the Painting The Feminine content is yours to keep! In Painting The Feminine we use a private Facebook group as our virtual studio space. I check-in daily (Monday-Friday) to answer questions, give individualized feedback, and provide support. You are not required to join the Facebook group, but it does help deepen the experience if you do. Register between now and Sunday night and save $40! 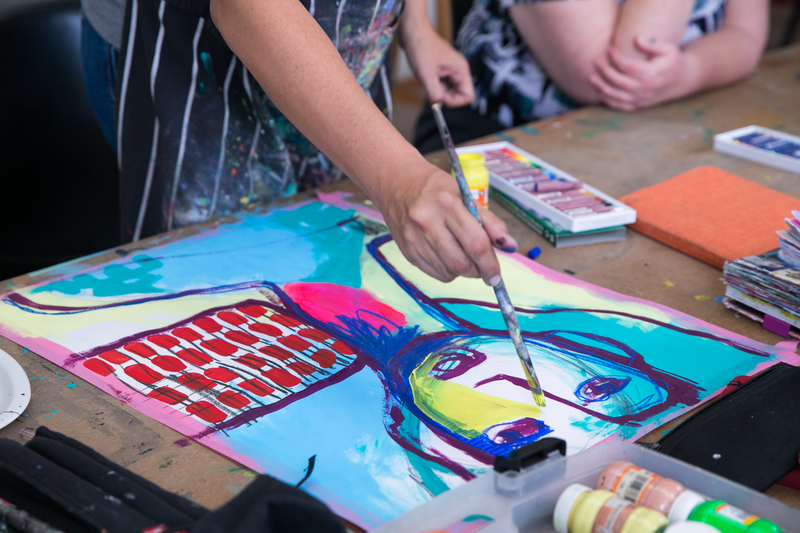 CREATE a cohesive body of art work that will reveal your own unique style, visual language, & expression. 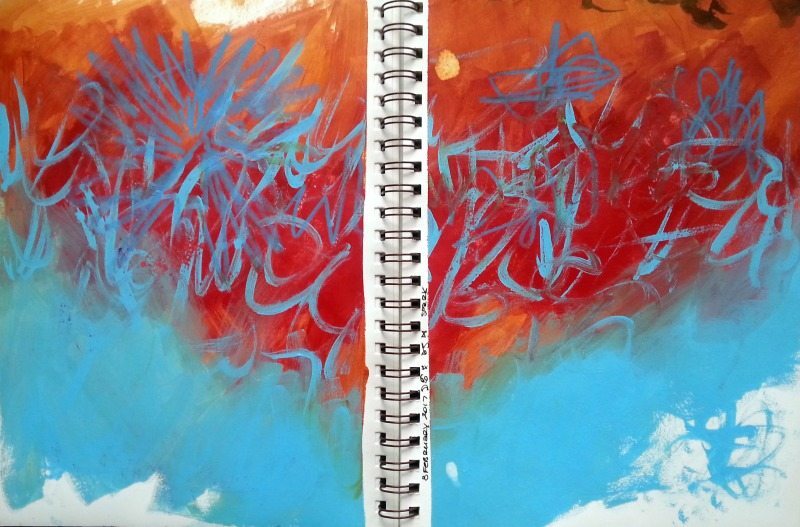 We’ll be painting in the art journal & on canvas. 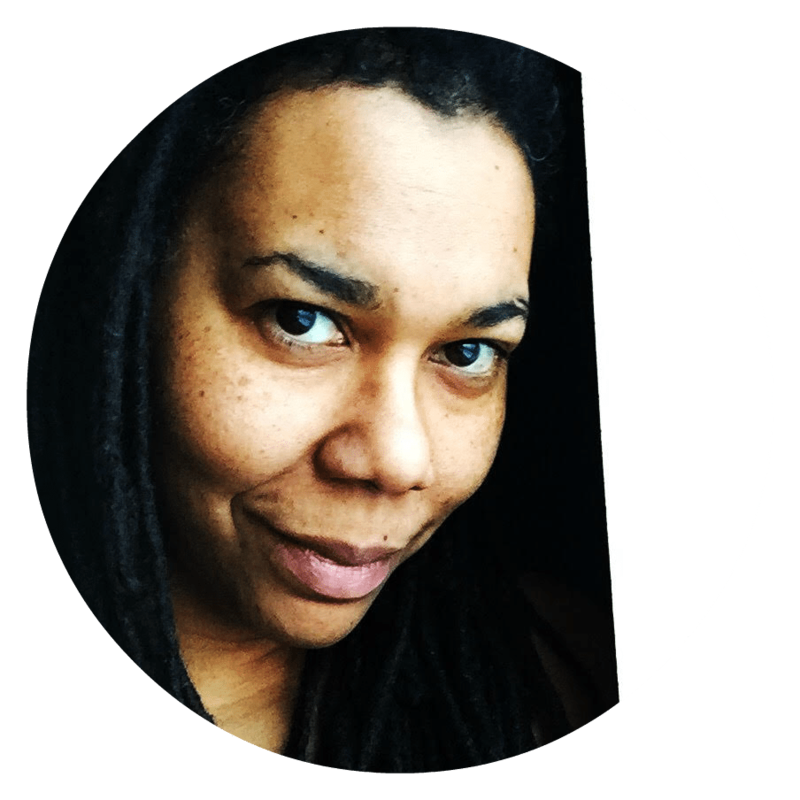 CULTIVATE a daily art practice that feels organic, nourishing, & totally do-able. 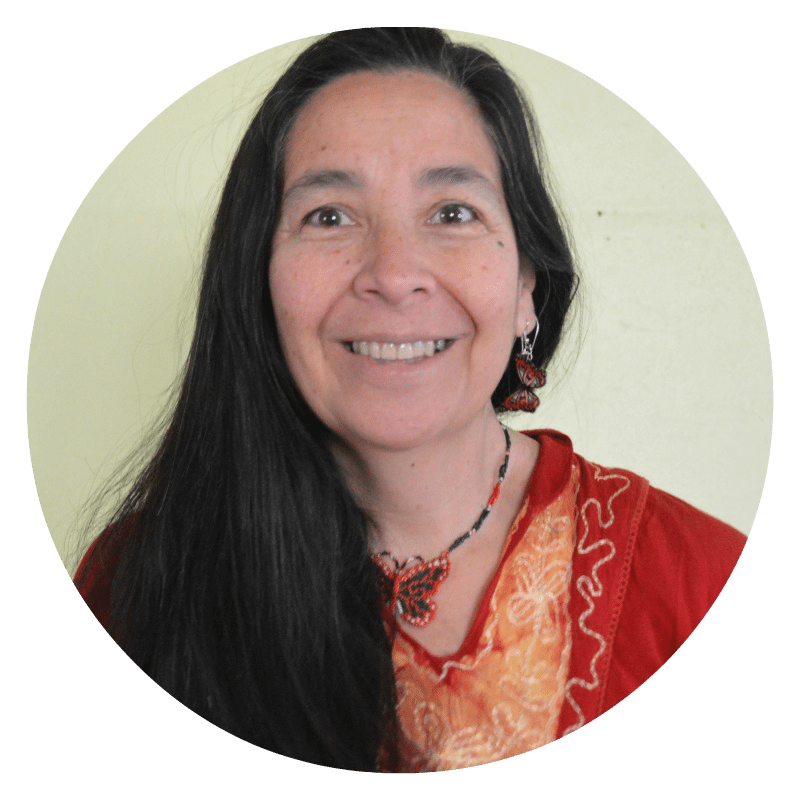 RECEIVE individualized feedback & support from Connie. 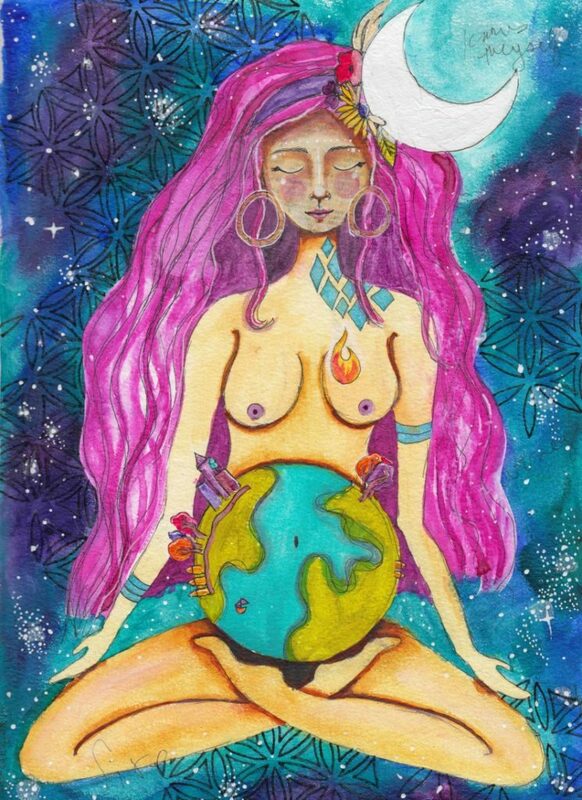 AWAKEN Feminine Wisdom in your creativity, relationships, & life. GROW more confident as an artist. 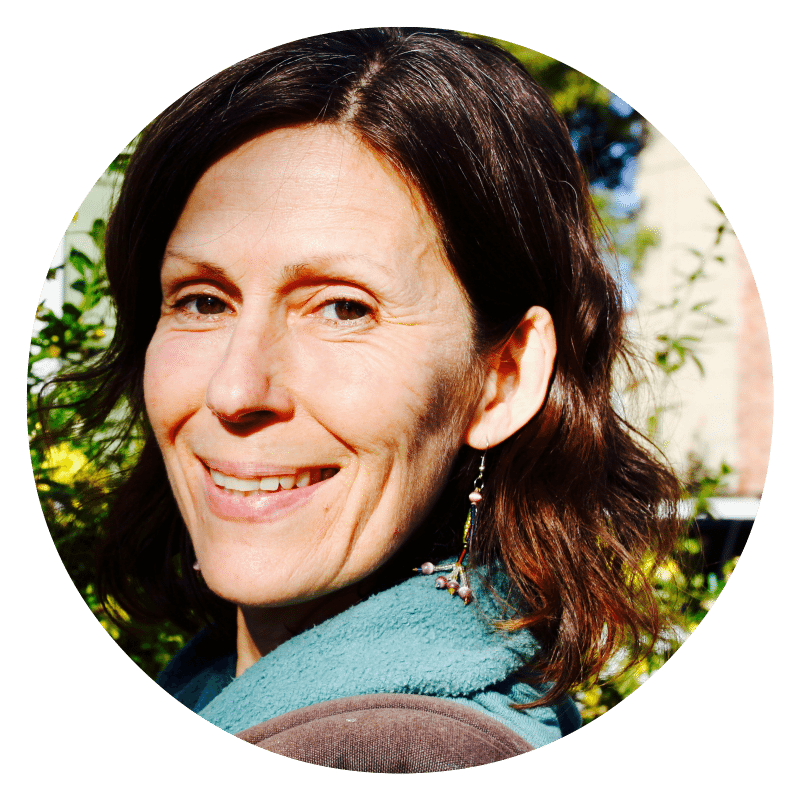 SHINE in a community of creative kindreds in a private Facebook group and on our weekly live calls. LIFELONG ACCESS to all the Painting The Feminine content including videos, audios, and emails. 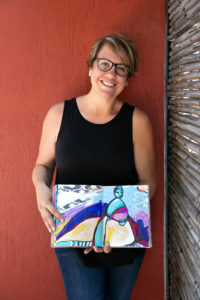 The Painting The Feminine format is designed to support and nourish you in creating your own unique Painting The Feminine series while cultivating a daily art practice that involves both painting in your art journal and on canvas. MONDAY | GROUP DISCUSSION We meet for five 60 minutes live streaming calls every Monday at 3pm PST/ 6pm EST on Zoom.com to discuss the Painting The Feminine concepts we will be exploring that week. These calls are recorded for anyone unable to attend and are yours to download and keep. 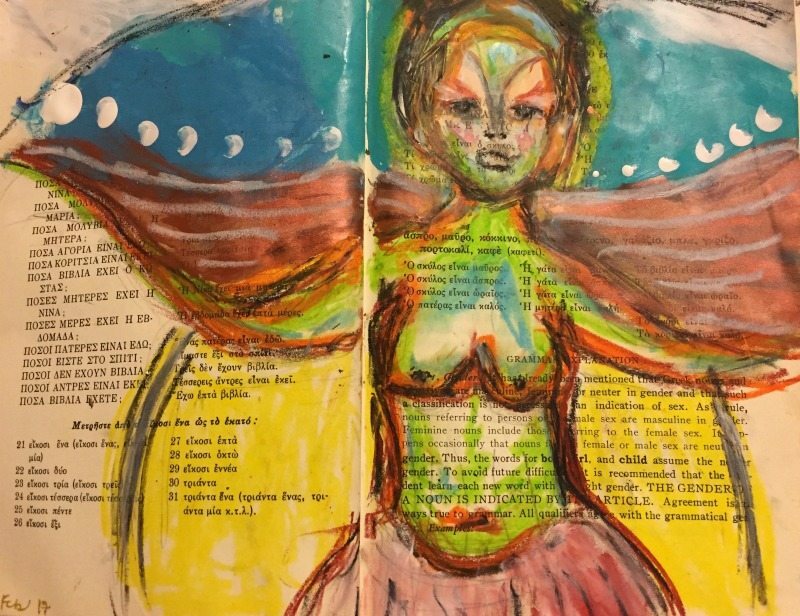 TUESDAY – THURSDAY | STORYTELLING & SUPPORT You will receive an email with a short audio that will provide you with just enough inspiration and support to fuel your daily creative practice and get you Painting The Feminine with gusto. FRIDAY | STUDIO VISIT On Fridays I’ll email you a video where I invite you into my studio! 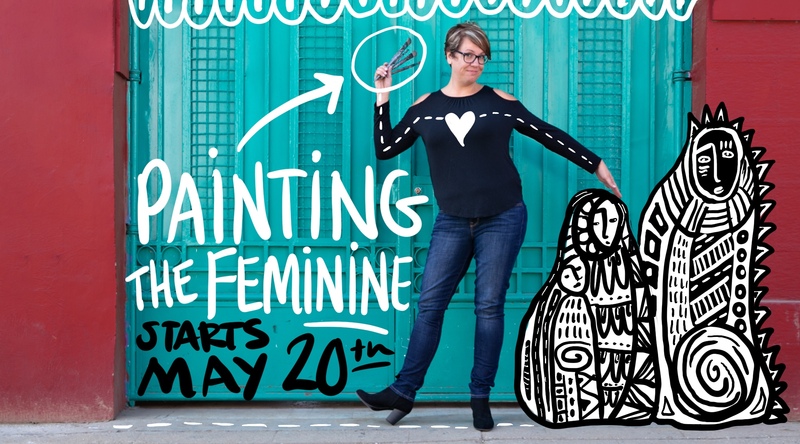 I’ll be sharing intimate insight behind my own Painting The Feminine process while you peek in while I paint! Please CLICK HERE for the Painting The Feminine supply list. 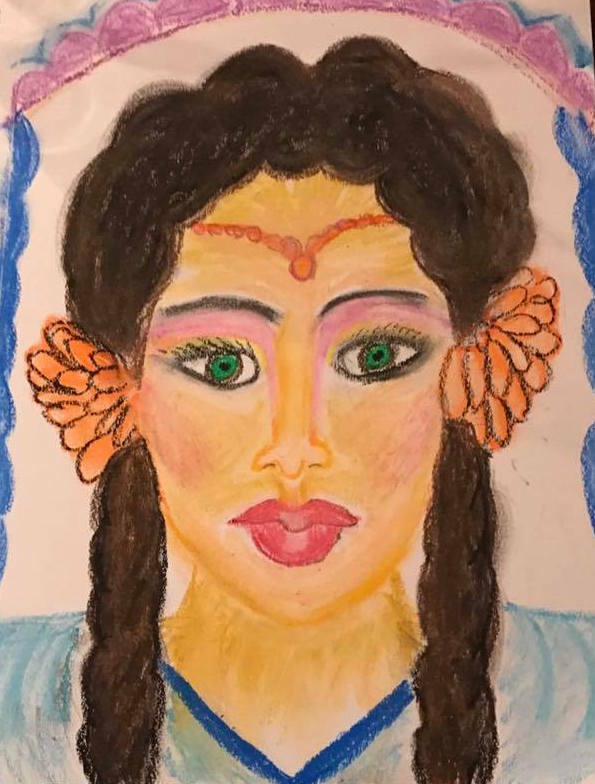 Scroll through the art below and be sure to CLICK HERE and CLICK HERE as well to see more work from past Painting The Feminine students! Thank you Connie for your lovely teaching skills. This art adventure was challenging for me to open up to a new creative flow, as I have little to no experience in Art. I enjoyed the guided meditative tours to the places we spent healing and expanding our feminine power. I loved watching Connie move energy while she painted. The message I keep hearing as I worked on my own creations was to just let go and let it flow. I’m inspired to keep on this path. 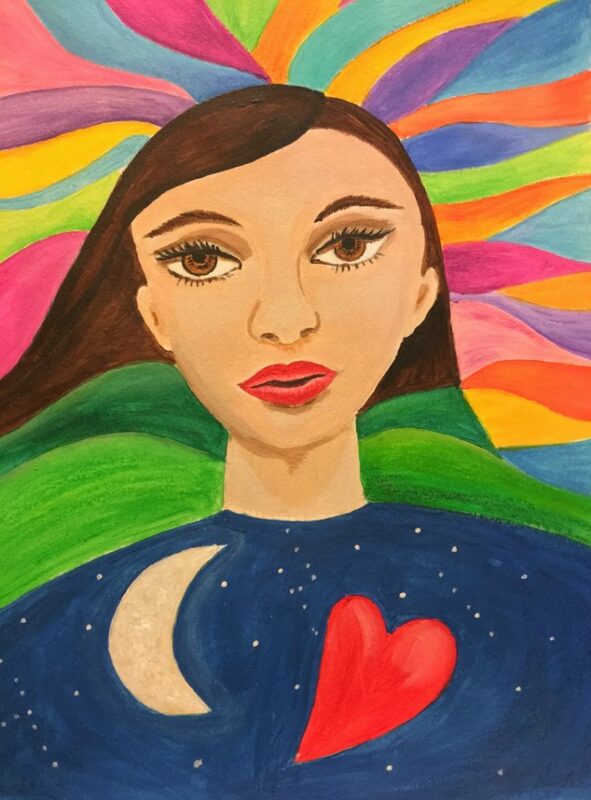 What Painting the Feminine has meant to me is…PTF meant a journey with beautiful souls that allow me to express and feel comfortable in it. I am very happy for this experience that also opened more my feminine qualities like intuition, passion, vulnerability, authenticity, nurturing, etc. It’s been an encounter with colors, brushes paper and canvas without restrictions, a sense of playing and sensuality, discovery and mystery. 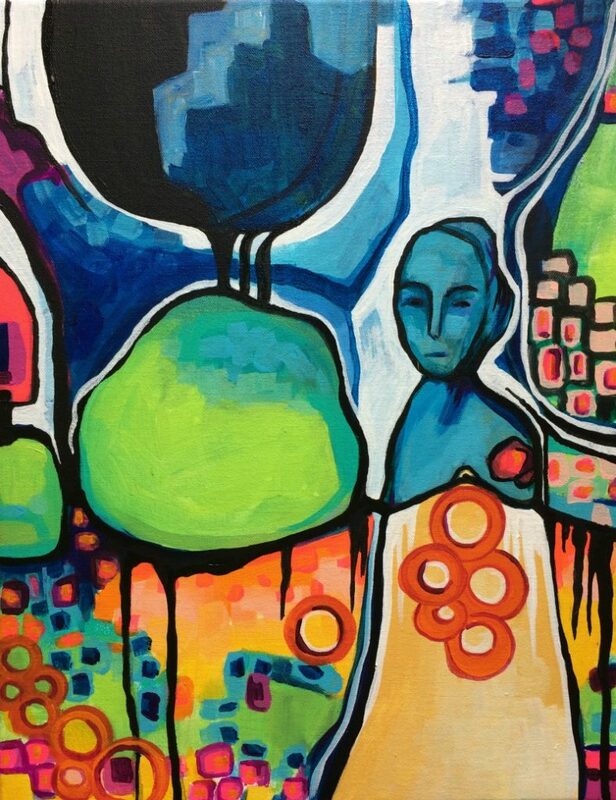 Intuitive painting has taught me to find meaning and abandon meaning simultaneously. Colors who want to be invited to the palette easily call attention, brushes dance on the surface, and I don’t make any plans for the process or have expectations. I simply let the image become itself, whatever that is in the moment. I am an Artist of Presence and Embodiment. It is my hope my art reflects these qualities. What I don’t want to forget about PTF is how it proved that so many women from all over the world are equally connected to feminism and art. 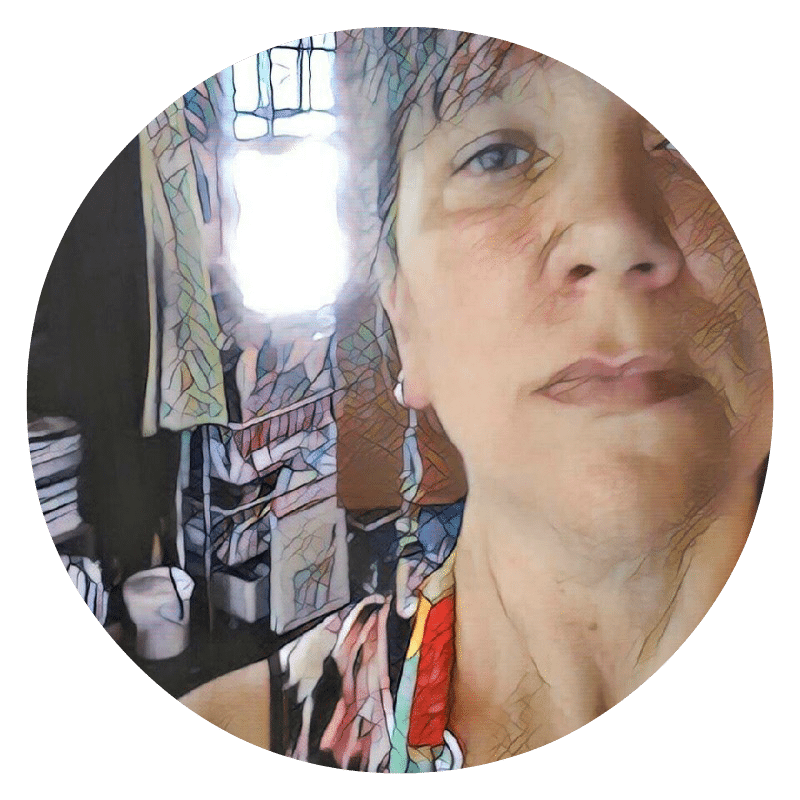 The sisterhood is strong and we always need to remember that we are all in this together through the creative inspiring days and the days that seem to just seem harder to connect with our inner selves. Connie is so inspirational with her words and art, and she helped me tap into places in my creative brain that have never been tapped before. 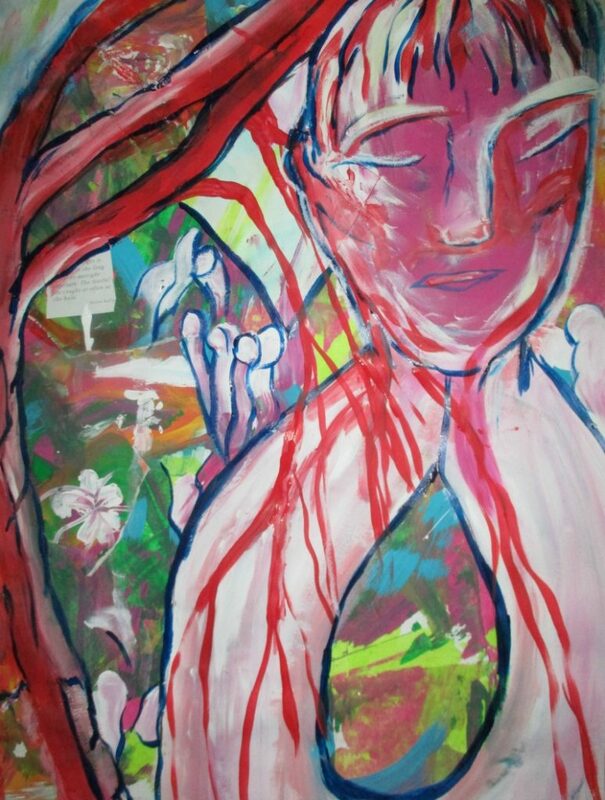 Painting the Feminine was an experience of listening to the whispers within, the ideas and inspirations of my heart. This journey has supported me in paying more attention to my voice, my soulful core which had been pushed to the side, silenced and ignored in order to appear acceptable within society. There is another way. 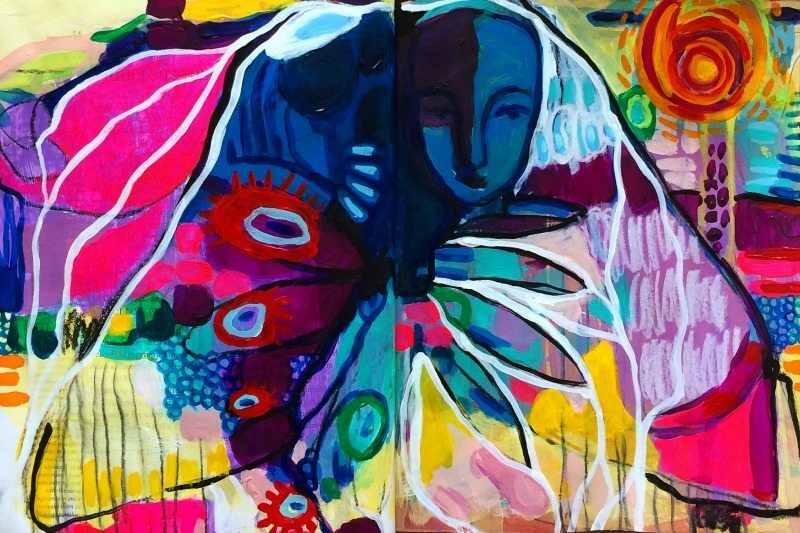 Painting the Feminine has strengthened my practice of embracing this other intuitive authentic way. PTF is about entering emptiness, spaciousness, formlessness and from there, drawing out beauty, presence and wisdom, like one draws nourishment from a well. It is a birthing of what the world needs into form. I am in awe of how very special painting the feminine is. It is an opportunity to know Self through connecting to source/beauty and then bringing that knowing into form through painting. It has informed how I show up in my life and then my life has fed back into my painting; and so it goes, around the spiral we travel. 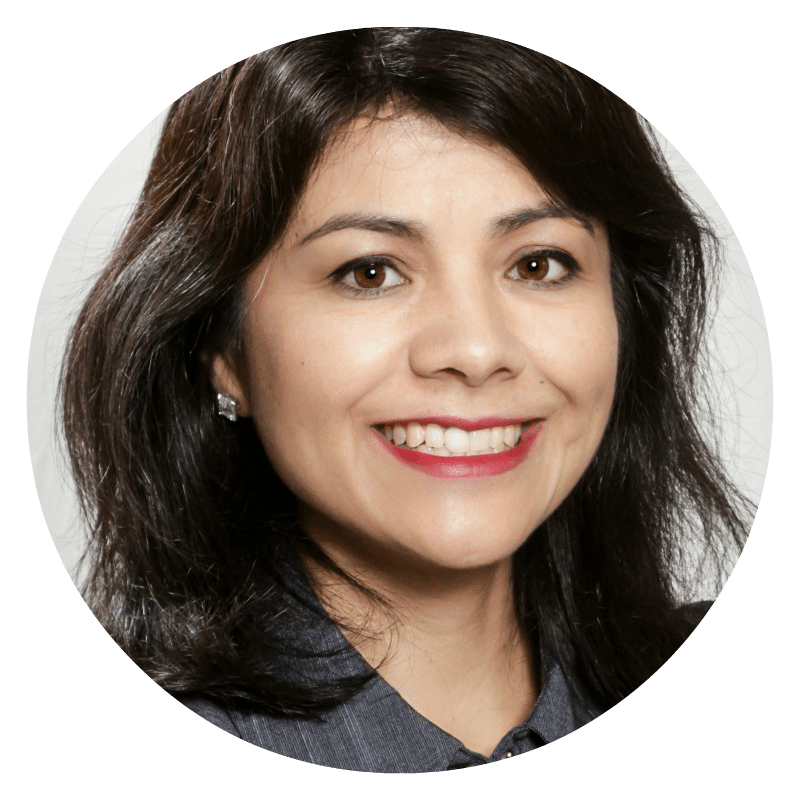 A little about Connie Solera…. 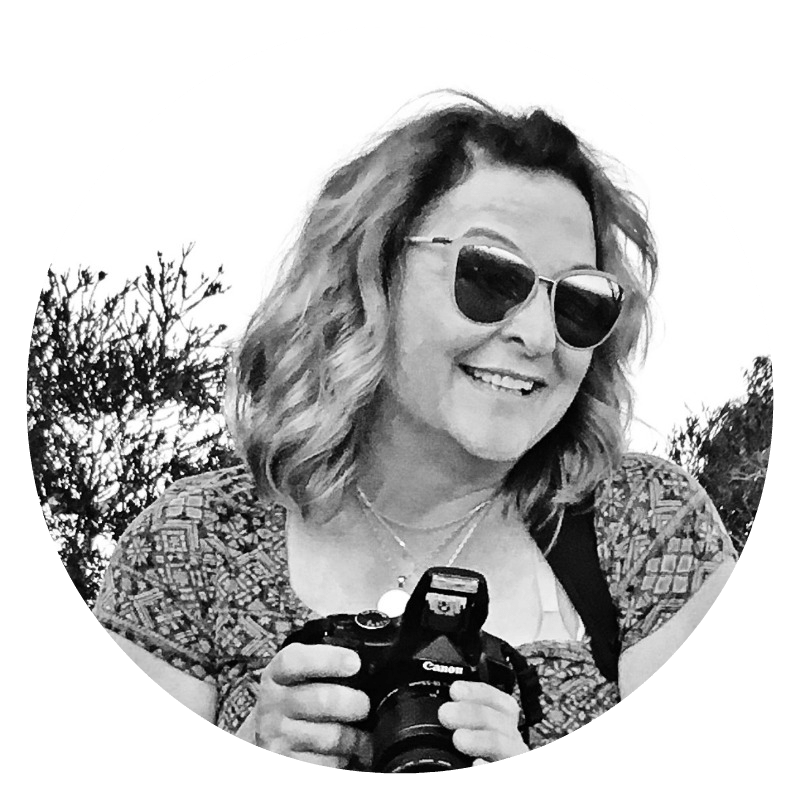 Connie Solera creates art, teaches, travels, and writes in order to inspire every woman to pick up the paintbrush, let go of her fears, and sink into the artist her heart is calling her to be. 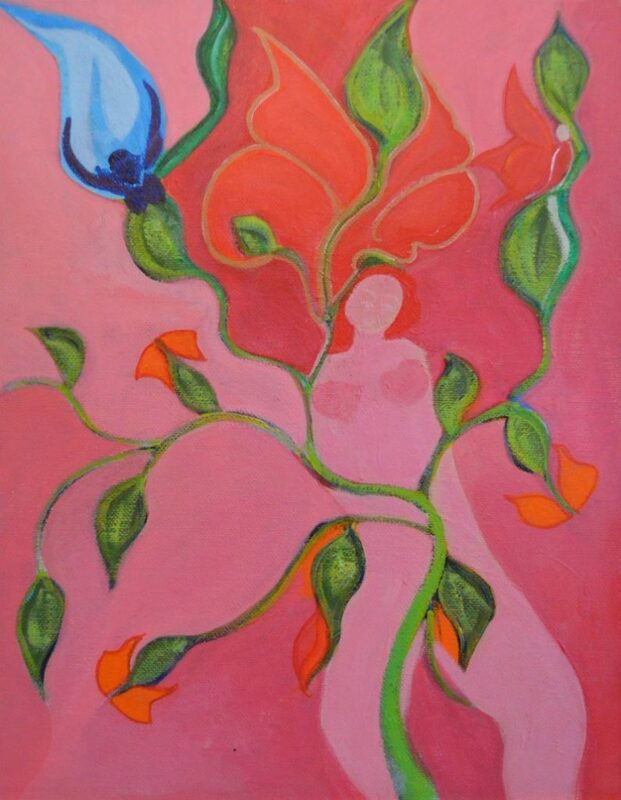 In 2013 Connie started Painting The Feminine as a personal journey of understanding and embracing the Feminine. Since then it has transformed into a bi-annual workshop that feels more like an art movement. Connie currently lives in the desert of Arizona with her talented husband Hansel and their beloved son Phoenix. When they’re not creating art together, the three love to bike, hike, and kayak every moment they can! Refunds will be made until Monday, May 20, 2019. On and/or after Monday, May 20, 2019 your registration fee is non-refundable. Please email your cancellation to Support@DirtyFootprints-Studio.com with your full name and email address you used to purchase registration. Your refund will be issued via Pay Pal within 72 business hours of receiving your cancellation. Failed payments will result in a $20 fee and your membership in Painting The Feminine will be suspended until payment is received. If payment is not received within 72 hours your membership in Painting The Feminine will be terminated and the remaining balance will be due immediately.